Oink was possibly the best comic I read as a kid. Totally nailed the kind of humor that appealed to me at that age (and the age I am now...). A friend still has isuue one and the flexi disc that came with. He can still be coerced into doing his own a cappella rendition when drunk. ootini wrote: Oink was possibly the best comic I read as a kid. Totally nailed the kind of humor that appealed to me at that age (and the age I am now...). I think there's a lot of people out there, you and I included, who have Oink! to blame/thank for our senses of humour! It's been great getting to know the creators through doing my blog and being part of the Facebook group, they're all a brilliant bunch of people and look back fondly on it. You should join the FB group if you have access and haven't already! Shinobi, while doing the most recent issue for my blog (well, most recent as in the one which went on sale most recently back in 1987!) I thought you'd love to see this Burp strip. I've included him so much in the blog recently I decided to leave him out on this occasion - at great pains though because this is great! But I thought you'd like to see another example of what this comic got away with! Definitely classic 80s humour and something which comics these days probably wouldn't be allowed to do unfortunately. Funny story about Fizz, sort of. When Acne finished, a lot of the artists went off to start a new comic called Fizog. The publisher of Acne wasn't happy about this, so launched a new one himself called Fizz, which reprinted lots of Acne strips without telling the artists (or paying them!). I've got a lot of love for Acne though... Trying to get the full set of them, think I'm only half a dozen or so away. 3DwhO wrote: Shinobi, while doing the most recent issue for my blog (well, most recent as in the one which went on sale most recently back in 1987!) I thought you'd love to see this Burp strip. I've included him so much in the blog recently I decided to leave him out on this occasion - at great pains though because this is great! But I thought you'd like to see another example of what this comic got away with! Definitely classic 80s humour and something which comics these days probably wouldn't be allowed to do unfortunately. 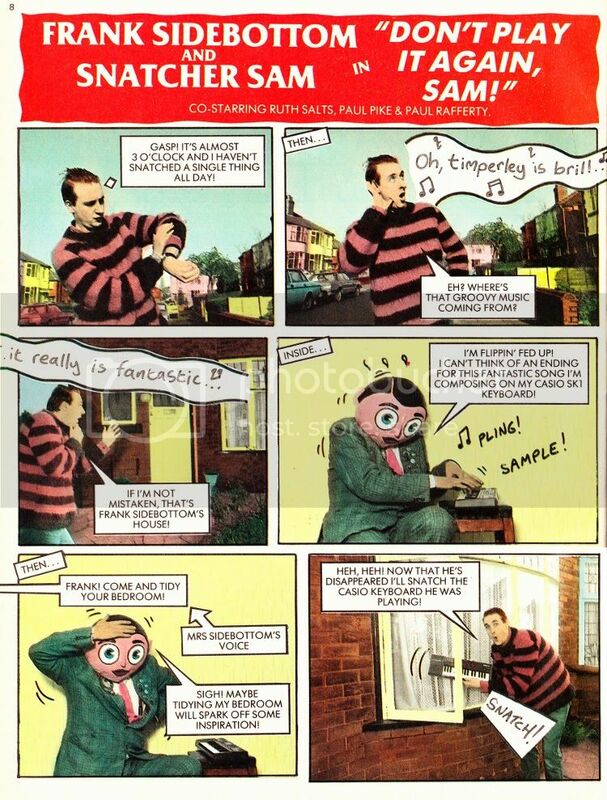 This is the "real" him in a spoof comic strip with BBC 6Music's Marc Riley and below that one of the pages he did. I've noticed I haven't actually included any of his comic strips yet on the blog. He did do 'regular'-ish comic strips in his own artistic style. The man behind the mask was called Chris Sievey and unfortunately passed away about five years ago now. His passing was reported on the BBC and reading it was what got me interested in Oink! again after all those years, so I feel like I owe him a debt of thanks, as not only is the blog great fun and very popular(!) but it's awoken a passion for writing and has started opening doors for me! 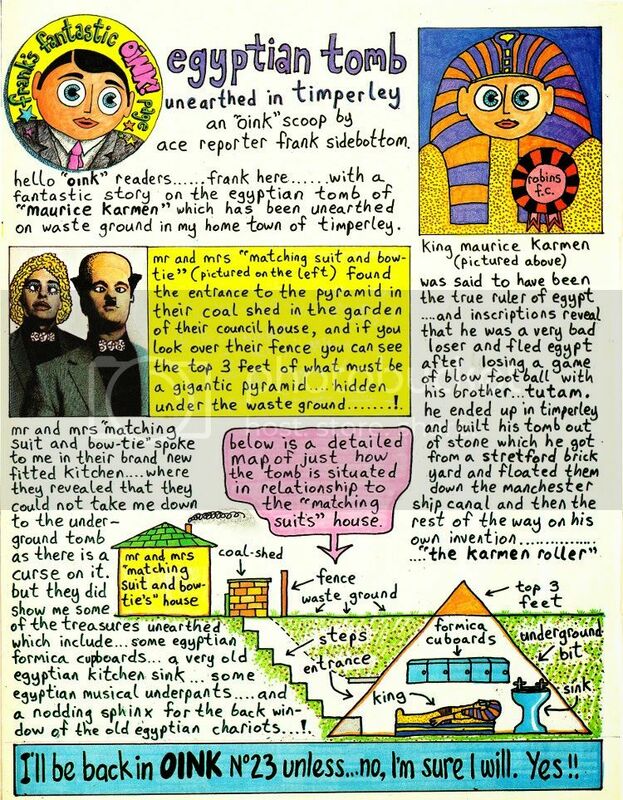 Meanwhile, I've just done an enormous write-up about Acne (and Fizog, and Fizz, and The Big Greenie), another of the "Viz for kids" variety of comic. SoupDragon wrote: What was that evil elevator (Max I think it was called) that took people to a 13th floor in? Eagle or 2000AD? Max was the computer in charge and he/it didn't like anybody upsetting his residents so he stopped the lift into a virtual reality world in which they ever died or changed their ways. He/it seemed to be sentient. He/it ended up in charge of a department store.